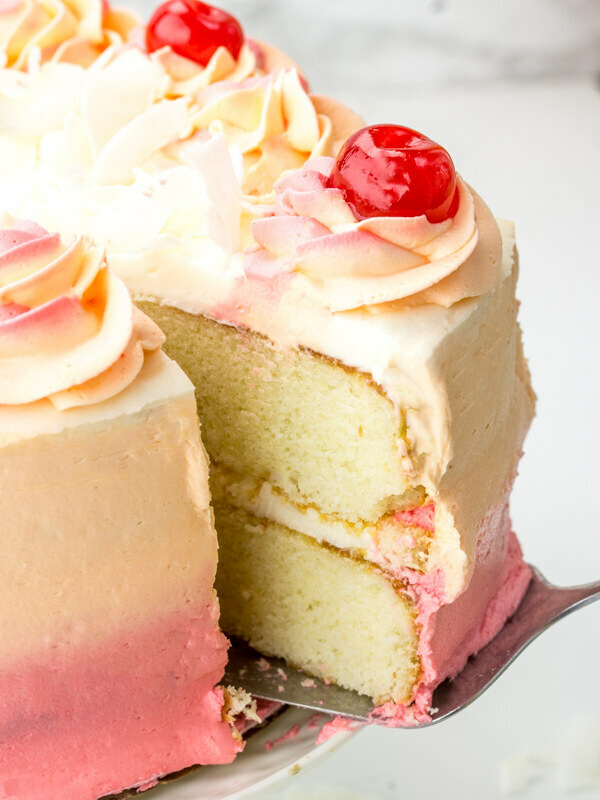 A fun delicious cake reminiscent of the popular drink this Malibu Sunset Layer Cake is a great cake for the long hot summers!So there is a little thing called cake and I love it. Lately I’ve been making cakes of all sorts. Layer, sheet, cup, bundt and poke. Like I just can’t stop myself with all these cakes you guys! Oh did I ever tell you that we started a new CAKE WEBSITE!?! Yeah you’ll need to check it out HERE! Anyways, my body is hating me right now, I’m supposed to be getting beach body ready and that IS NOT HAPPENING. But I like food too much so I don’t think that it will really every happen. So I’ll just be comfortable in my cover up and once piece for now. Pre-heat oven to 350 degrees and spray and line 2 8" round cake pans with cooking spray and parchment paper. Mix together milk, Malibu, egg whites and extracts in bowl until blended well, set aside. Mix cake flour, sugar, baking powder, and salt in a large bowl and mix together with hand mixer. Add butter and continue beating until combined. Add in your milk mixture and beat until blended. Pour batter evenly between two cake pans. Bake for 30 minutes for until center is set and springs back when touched. In bowl add your butter and shortening and mix with hand mixture until light and fluffy, add in your vanilla and continue to mix. Add in your powdered sugar 1 cup at a time then add in milk until you reach desired consistency. Set aside. In bowl add your butter and shortening and mix with hand mixture until light and fluffy, add in your grenadine and continue to mix. Add in your powdered sugar 1 cup at a time then add in more grenadine until you reach desired consistency add in your food coloring until desired color is reached. Set aside. In bowl add your butter and shortening and mix with hand mixture until light and fluffy, add in your pineapple juice and continue to mix. Add in your powdered sugar 1 cup at a time then add in milk until you reach desired consistency add in your food coloring until desired color is reached. Set aside. On a turn table or cake stand layer one of your 8" cakes. Spread half of your vanilla buttercream over the top util about 1/2" from edge. Using a flat large ribbon tip pipe 1 cup or more of your cherry buttercream around bottom of cake, reserve remaining cherry buttercream. Again using the flat large ribbon tip pipe 1 cup or more of your pineapple buttercream around the top side of the cake, reserve remaining pineapple buttercream. Using a cake or bench scraper press edge against your cake and spin cake to blend the two frostings together until smooth. Add the remaining vanilla buttercream to the top of your cake and spread over and blend with the edge of your pineapple buttercream. Add the remaining cherry and pineapple buttercream to another piping bag fitted with a large open star tip, orange on one side and red on another and pipe some out until the two colors blend. Pipe swirls around top of your cake (You may have leftover frosting). Garnish with cherries and coconut flakes if desired. 0 Response to "MALIBU SUNSET LAYER CAKE"